The weather since our arrival in France has been wonderful. I, for one, like global warming and that has been the weather. With blue skies and darkness coming at about 10pm each day. The boat seems to have handled my absence very well. A couple of hours of work had everything in its place. We used this time period to see some more of the town, now with Marianne along for the ride. A visit to the food store, a walk up to a landmark above the river, a meal at a restaurant and we were ready to head upstream. A couple of notes about the boat. It has been about 5 weeks since I last plugged the boat into shore power and even that was not needed. For some reason the systems like to have the batteries charged to a set level and it will not accept the sun as the source. But when I have plugged in, the system has not reset itself. It is working correctly but the dumb measure of "percent remaining" has gone to zero and will not come back to 100%. If I just ignore it I am fine but would like all systems to be giving good data. The engine continues to sound great. Still burns some oil as all DAF engines do, I am told, but moves us through the water with ease. Have been able to mount all four cameras to give us a view to the stern, port and starboard sides and a look just in front of the boat. The stern and bow cameras will be most useful when mooring in tight space between 2 boats; the bow and side cameras will be used in locks. With a few tries it is obvious that I must also train myself to use the views; not pushed, I have found I ignore the views. Practice. With a few refresher comments about locks and lines Marianne is game for pushing up river. On this portion of the river most of the locks are automated but at the beginning we have a short tunnel to cut through a small ridge so the locks one and two will have workers on site. The lifts tend to be reasonable but we see a lot of wall in addition, so the distance between water and bollard is somewhat more than we expected. The lock workers lower a hook to take our lines. Passing through the tunnel is fun and we immediately come to the next lock. This is where we save a life. As we come into the lock the doors close behind us and we see the lock worker coming down the steps to take our lines. With him is his wire haired terrier, name unknown. Having reviewed the video tape for the view, it is possible that when the keeper was picking up his long pole that is used to snag our lines he may have goosed the dog to the edge and over. About 15 feet or so. This happens behind the worker and Marianne is getting the lines and also misses the mishap although she hears the splash. Quickly everyone knows there is a problem. The dog is swimming but has no idea what to do. First time for everything. What to do? The worker rightly chooses not to jump in. There is a wet, slippery ladder but not a good option. It is up to us. How can we save the dog? With a bit of encouragement we are able to get our new boat hook under her and guide her to the side of the boat. Only by lying on the deck at the low point am I able to reach the scruff of her neck and take a grip. I am lying prone and not sure I can make the move to get up with dog attached. But somehow it works and she is on board. Water is added to the lock, the boat comes up and dog and master are reunited. For eight years the four-footed lock assistant has been coming to work and this was her first tumble. In all the confusion we failed to get her name but here are some pictures. And it all gave a chance to use the cheap headline. This year we resolved to take each day slower. We have the new advantage of not needing to find a place to "plug in". And I think I have figured out the water system so that we can have all tanks full and not causing any floods. So when we see a nice place to tie up, we will (famous last words). We have seen the town of Haybes from the train and make that our first stay. Little town, nice mooring with low prices, a baker, a nice restaurant. Meet a few other boaters and relax. The next day we move up to Montherme. The marina is full but luckily we decided to pull over and tie to a guardrail with several other boats before the marina. Two local girls give us their best interpretations of English speakers and I have an equal conversation back in French. We can not see it from below but had we been up on the ridge above town we would have taken a picture of the river nearly circling the town as it meanders around all high obstacles. On the postcard it looks neat. The next mooring is Charleville. Found space at the marina, but just barely space. Cameras were helpful in fitting in the only slot available. Real pleased with how well we did. We are seeing our first day-long rain. 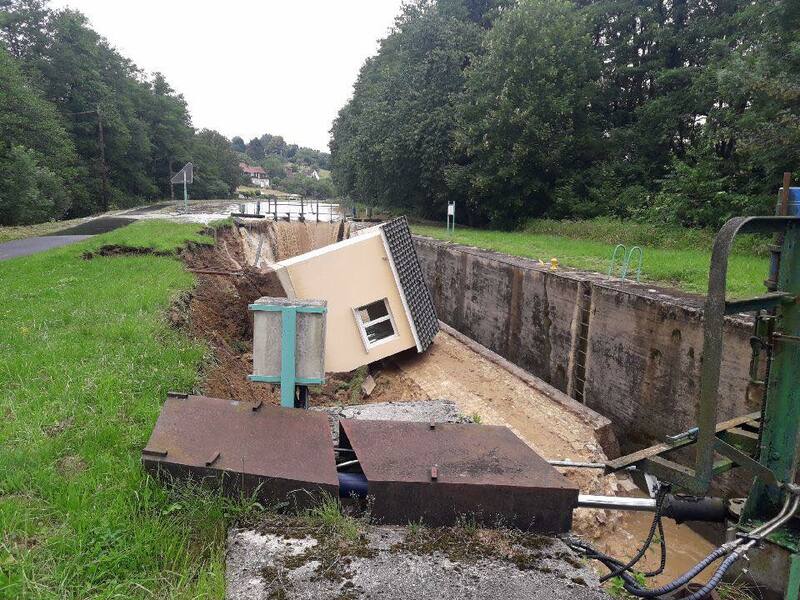 Notice from somewhere that this has been the wettest June in France in some time. 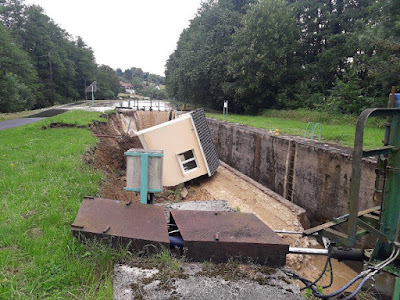 On the Canal des Ardennes the water got the best of one lock. Somehow a channel worked behind a lock wall causing the wall to fall into the lock. Canal now closed for through traffic until December 1. Hope we can get through the Meuse OK. The river is high and muddy and flowing very fast. We have held up for 2 days to let things settle. Charleville is really Charleville-Mezieres but we are only visiting the Charleville side. The centerpiece is the main square or place. Large enough for 2-3 cities. Among our activities is eating, visiting the tourist office, a tour through the Museum of the Ardennes, visits to book stores and eating ice cream. The stone you see in the Place is common throughout the city and region. All the buildings around the Place have the same basic design. What is different is the style of roof. Similar buildings continue all around the Place. The VHF radio is broken. Will not turn on. Checked the power and is fine. Not a great need where we are as the locks are automatic but talking from boat to boat is sometimes needed. Order a new hand-held unit which is shipping from the UK. Will need to catch a train back to Charleville when it arrives at the tourist office. On the way to Sedan we overnighted just at the entrance to the Canal of the Ardennes then on to Sedan. We have driven stakes along a stone wall and find we have a front lawn. This city is known for the role in WWI but even before this was land that the Germans have vied for over the past 150 years and maybe longer. This being the 100th anniversary for WWI, you see special events and displays. Also saw a good number of WWII pillboxes along the Meuse. The largest castle fortress in Europe is near the downtown area. Downtown Sedan is a bit rougher than some other French cities we have been to. But it has the normal count of cafes and parks. Everything is an easy walk from the mooring including this one.